Use or FREE sole trader registration service. Registering as a sole trader is the most common way to start a business in the UK. About 76% of all UK businesses are sole traders. Sole trader business are most commonly used by very small business with a low turnover, low risk and a single owner. Larger businesses, or those with multiple owners, or higher risks, tend to use private companies limited by shares (otherwise just known as limited companies). You can find out more about setting up a limited company in our ultimate guide. Is a sole trader a company? One of the biggest areas of confusion around sole trader businesses is exactly what they are. A company is a business that has been “incorporated” into a Limited Company and exists as a separate legal identity to the individuals involved in the company (the directors and shareholders). Can a sole trader have a business name? A sole trader business may also have a “business name” or “trading name”. John Smith decides to start a plumbing business. He’s not bothered about having a different business name. He simply trades as “John Smith”. Any invoices or quotations he issues will be issued in his name with the address he trades from. Any invoices, quotations and his business website must have his business name and a statement containing his “legal name” or “legal status”. On letterheads and websites you will usually see this in the footer. Won’t people think I’m a one-man-band then? A sole trader business DOES NOT have to be a “one man band”. They can employ other people to work for them. Perhaps the best example of a really big sole trader business is Sports Direct founder Mike Ashley who having started business in 1982 did not transfer his business to a limited company (known as incorporating a business – note the terminology) until 1999 when he already operated 100 stores employing 1000’s of staff. A sole trader business is owned 100% by the “sole proprietor” and cannot have “partners”, “directors” or “shareholders”. How do you register a sole trader business? As we have noted a sole trader registration does not register a company. Nor does it even really register a business. A sole trader simply notifies HMRC that they intend to start working for themselves, essentially telling HMRC they are becoming “self employed”. HMRC will ask if the sole trader business intends to have a “business name” or “trading style”, but this is not in order to register the business name and HMRC will not alert you if there are other businesses using the same name. The only proof that you will get that you have registered as a sole trader is a Unique Tax Reference (UTR) number. HMRC will send this to you around 10 days after your sole trader registration has been completed. Unlike with a limited company there is no certificate, or other documentation, to show you are registered as a sole trader. Also unlike a limited company there is no public list of sole traders that anyone can look you up on and no public database they can look your UTR number up on. There are a few private companies who will offer you the chance to register your sole trader business on the ‘Small Business Register’ or something equally official sounding. These private business registers are not run by the government and you are absolutely not required to register with them. Who are sole trader registrations good for? A sole trader registrations is the easiest and simplest way to tell the government about your new business activity. If you are starting a small business on your own, or just testing the waters on a new idea, then a sole trader registration is a low cost way to do things. Registering as a sole trader will keep HMRC happy but you won’t have to do much paperwork and there is just a single simple tax return to do at the end of the year. As a sole trader you are registering yourself as a self-employed individual. Therefore you, as an individual, are personally responsible for anything your new business does. This is one of the big downsides of registering as a sole trader. With a limited company it is the company that takes on contracts and loans. If the contract or loan goes bad the company is responsible and not the individual company directors. So that means that as a limited company director your home, your car and the rest of your personal finances are protected from damage. As a sole trader you do not have this. If your sole trader business gets into trouble financially there is no distinction between the business money and your personal money so it will be you as an individual that has to clear the debts. For many sole traders this is not a massive issue. If you are running a consultancy, or a small craft or catering business you are unlikely to be taking big financial risks. It is more likely to impact on people who are working in construction, are buying large amounts of equipment and resources, or who are taking on a lease for a shop, café or other similar properties. In these circumstances there is more risk of financial problems and it can make more sense to go limited. When you register as a sole trader you will be asked what name you intend to use. This does not mean that you are registering or protecting that name. HMRC want to know what you will be calling your business so they can track it and make sure you are paying enough tax. They keep this information private. There is no public list of sole trader business names and HMRC will not tell you if you are using the same name as someone else. So as a sole trader your business name is not checked, registered or protected in any way. If you use a name for your business which someone else is already using you can get yourself sued and can be forced to change the name. If someone else uses your sole trader name then you will have to take them to court and try to prove that you should have the right to that name. This can be expensive and is not always easy. Sole trader names and the law of “Passing Off”. Two sole trader businesses can use the same name as long as neither of them objects. There are certain names that get used over and over again for florists, fish and chip shops and other small businesses. 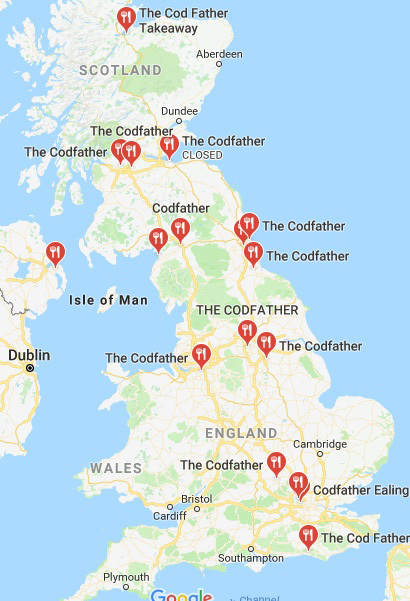 There are lots of fish and chip shop businesses (Sole traders and limited companies) using the business name “The Codfather”. 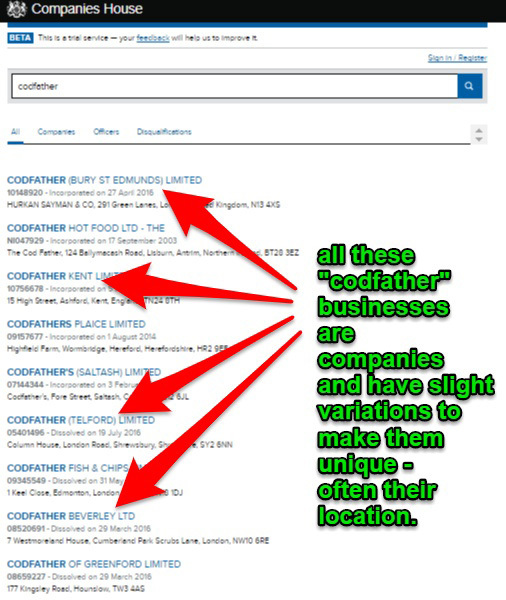 Here is a list of limited companies using the “Codfather” name. Remember limited companies CANNOT have a name that is the same as another limited company so each company here varies the name slightly. There are even more listed on Google (search) that do not a maps listing. As long as two businesses, let’s say florists, with the same name are not in the same town, or in neighbouring towns, then it is unlikely customers will get confused (or owners will . If two florists share a name and one is in Newcastle and the other is in Portsmouth it may never cause them a problem. If, however, the two businesses are close to each other people could get confused between them and it could be seen that one business is trying to “pass itself off” as the other business. While traditionally having two business that are a long way apart would mean there was not problem with them sharing a name the internet has changed things. Most businesses these days will have a website and will want to show up at the top of Google when someone types their name in. Having multiple businesses with the same name can make this harder and can more easily lead to confusion. So, if your business is going to have any kind of online presence it is better to go for a unique name. All businesses should show their full “legal status” on any business communications, this includes, websites, emails and sales materials. Remember that as a sole trader you register as an individual, not as a business, so any name that you use should be in the format “Bob Smith trading as Your Brand”. You can have the brand name in big letters at the top of your website or sales brochures as long as the full name, including your name, appears at the bottom. Company name search – you can use the company name search tool on our website to see if there is already a limited company registered which is using exactly the same name you wanted to use. If there is already an existing limited company using the name then they are likely to have a much stronger case than you in any future name disputes. So you may want to opt for a different name. You can now also do a search on the Companies House website which will show you all limited companies with names that contain a particular word. This will help you to find companies that have a name which is similar to yours but not exactly the same. you want to use should show you other businesses with the same name. 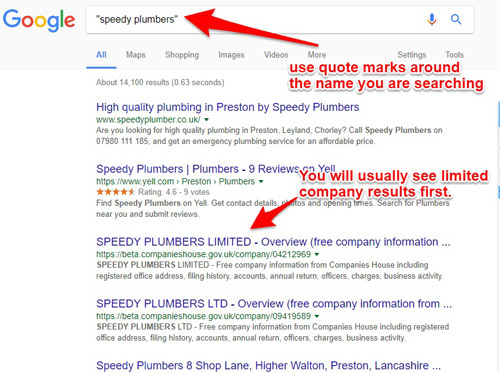 If your business name is descriptive (EG Speedy Plumber) use quote marks around your name in Google search which tells Google you want to see results that match your search words in order. This will stop Google showing site results that contain the words in your business name anywhere on a webpage. Trade mark search – a trade mark is the strongest form of protection you can get for a business name or brand name in the UK. You can do a search on the IPO website to see if anyone has registered a trademark with your chosen name. Trade marks fall into 45 different classes with each class relating to a different industry. If someone has a trademark in class 8 but your business falls into class 32 then you would not have a conflict. So while you will probably want to be aware of all trade marks that use a similar name as your own it is the ones that are in the same industry that you really need to be concerned about. Registering a dormant company is a popular way for sole traders to establish their claim to their business name and to protect it. By registering a dormant company your chosen business name will get listed with Companies House. Once it is listed with Companies House no-one else can register a limited company with the same name or one that is very similar. Of course this doesn’t stop another sole trader from using the name but it does should discourage them. Sole traders should also be checking the Companies House register when picking a name for their business so anyone who is doing the correct checks will see your company name and think twice. If you were ever to get into a dispute about the name having registered the company and being able to show the registration date and paperwork can be very helpful. So, while a dormant company registration is not fool proof protection for your business name it is a solid step to take. When you register a dormant company to protect the name you cannot trade through it. This means that you can’t use the full company name with Ltd or Limited on the end on any of your invoices or correspondence. Similarly you can’t use the company number when applying for trade accounts or approaching new clients. If you start to do that then you will technically be trading through the company and you will be expected to do all of the tax and paperwork for a limited company. How do you register a dormant company? You register a dormant company in the same way as setting up a standard limited company. This means picking a name, and appointing directors and appointing shareholders. You can find full details of this process in our dormant company formation guide. SIC Code - When setting up your limited company you will be asked to enter an SIC code. This tells the government what industry your business is in. The SIC code is largely used for statistical purposes and it is listed on the public record for your company. You can enter up to 4 SIC codes for your business. SIC number 99999 is used for a ‘Dormant Company’. HMRC – HMRC are automatically told about all new company registrations and will write to you about 3 to 4 weeks after the company is registered. This letter, known as a CT41G, is mainly about Corporation Tax and will ask what your business is going to be doing, when it will start trading and who your tax agent (accountant) is. One of the options HMRC will give you is to tell them that your company is going to be dormant and not trading. They will then know not to chase you for tax payments. Companies House – to stay registered, and avoid getting fined, all limited companies have to submit a Confirmation Statement and a set of account to Companies House each year. As a dormant company you can complete a simplified set of accounts known as dormant company accounts. This tells Companies House that you have not been trading and that your company has been dormant. 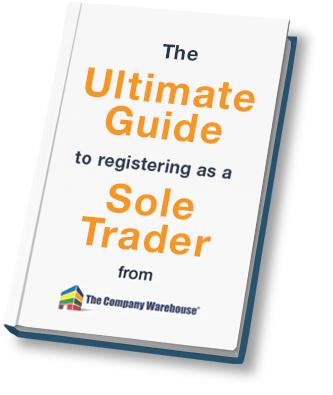 Who needs to register as a sole trader? If any of this applies to you then you need to register with the government and the easiest way to do this is as a sole trader. HMRC recommend that you register as a sole trader as soon as you can after you start trading. The latest that you can register is by 5th October in your business’s second tax year. You could be fined if you don’t register in this time. The tax year runs from 6th April to 5th April every year. It is very common for people to setup as a sole trader alongside having a full time job. Registering as a sole trader is the most common way to register for people with hobby businesses or who do a bit of freelancing in their spare time. It is also a popular way to register if you want to test a business idea out before quitting the 9 to 5. Your employer will not automatically be told that you have registered as a sole trader and you will continue to get your wages and pay tax as normal. The only difference is that you will be expected to complete a self assessment tax return at the end of the year. How much does it cost to register as a sole trader? It is free to register as a sole trader whether you do it through the government website or through TheCompanyWarehouse.co.uk. How long does it take to register as a sole trader? We can register your application to be self employed today. To register as a sole trader yourself (directly with HMRC) you must have a government gateway account. It typically takes around 10 days to get an activation code for the government gateway account. Once you have your government gateway account setup then you can complete the sole trader registration form. Once you have completed your sole trader application form it will take another 10 days or so for HMRC to sent you your UTR number which effectively confirms that you are registered as a sole trader. By using TheCompanyWarehouse.co.uk you can cut out the first step. We already have a government gateway account so we can just do a sole trader registration for you straight away. As a sole trader you can start running your business as soon as your application has been submitted. You are then legally obliged to start keeping accurate business records straight away. These should include everything you spend on the business and everything the business earns. Some people choose to do this on a spreadsheet which is fine if you just have a few transactions but as your business grows you will probably want to switch to specialist bookkeeping software. This will allow you to keep track of your incomings and outgoings more effectively and to run your business more efficiently. All sole traders have to complete a self-assessment tax return each year. The deadline for doing this is 31st January each year. On the self-assessment return you have to show your total income. This will include any money you earn from a regular job, or from savings or other sources. What HMRC are really interested in is how much profit you make as a sole trader as it is the profit you pay tax on. As a sole trader you will pay 20% tax on any profit you make after all of your expenses have been taken into account. You will also be expected to make National Insurance contributions depending on the level of profit you have.